CELEBRATE THE BLEND OF CREATIVE ARTS & CRAFT BEER ALL WEEKEND! 540 Clay St. x 532 Clay St. 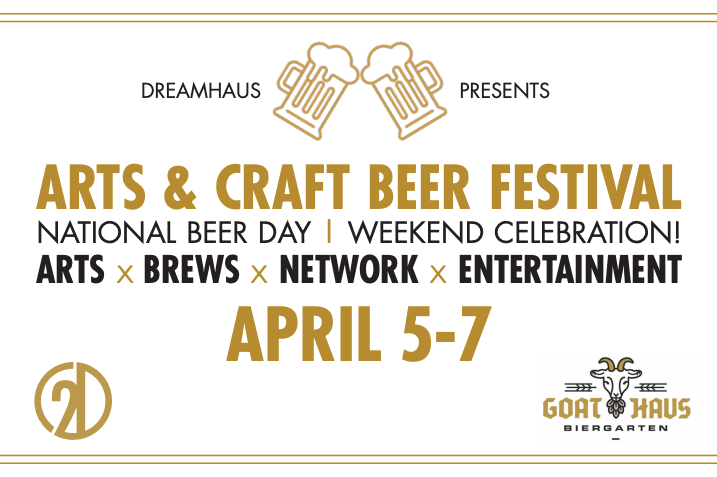 In celebration of National Beer Day, 21 Dreams + Goat Haus Biergarten we will present a weekend full of specially crafted brew, signature bar bites, entertainment all intertwined with the creative arts! Join us on Friday for the Exclusive VIP Reception hosted at the 540 Clay St. Art Gallery with a wine tasting, light hors d'oeuvres and a Dreamhaus gift bag! VIP ticket holders will also enjoy exclusive drink specials next door at the Goat Haus along with live music. The Goat Haus will also be open to the General Public (Non-ticket holders). Saturday is our full festival day where we'll kick off the day with Art at Brunch, followed up with a creative arts fair, DJ Mix show, live painting, an evening music performance and all day drink specials! All day access to VIP ticket holders & Patrons. Brunch ONLY will be open to the General Public (Non-ticket holders). National Beer Day is Sunday! Join us for networking, brewing demos, and more good vibes! Open to VIPs, Patrons and the General Public (Non-ticket holders). If you are interested in being a creative vendor on Saturday, please email us at info@21dreamsmgm.org.